Northern Voices: Up to a million children to lose free school meals in England under Government plans! 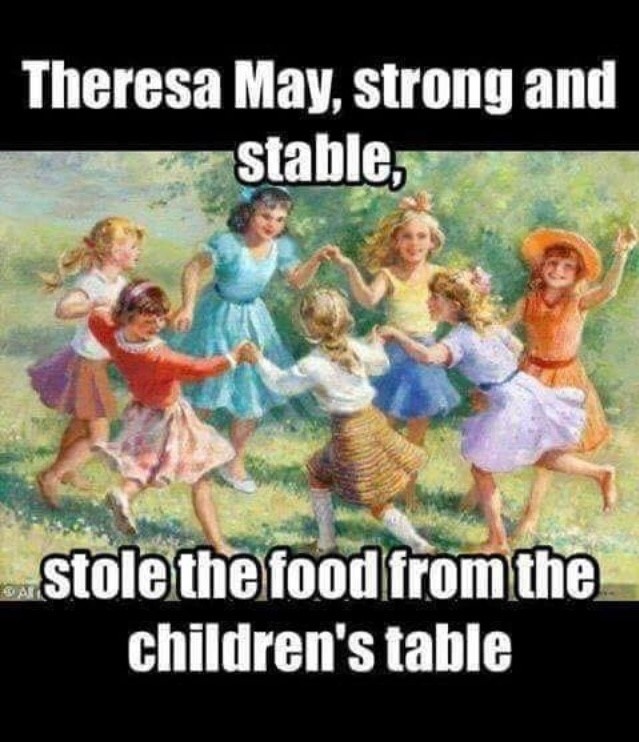 Up to a million children to lose free school meals in England under Government plans! THE political party that snatched away free milk off school kids, is now planning to take the food out of their very mouths, to save money. Up to a million children could now lose their free school meals if the Tory Government gets its way. Currently, all families receiving Universal Credit can claim free school meals. But under new rules for Universal Credit that come into effect on 1 April, children in Year 3 and above, on Universal Credit in England, will now not normally be eligible if their parents earn more than £7,400 in a year. The Children's Society has warned that the plans will create a 'cliff-edge' where many families would be better off taking a pay cut, even though Government claims that Universal Credit, will make work pay. However, Labour have pointed out that while up to a million youngsters in England could be denied free school meals under Government proposals, Theresa May's alliance with the Democratic Unionist Party (DUP) - which keeps her government in power - has led to the Government protecting Northern Ireland from the free school meals cut. Under the proposed changes, the same threshold for Northern Ireland families to be eligible, is double that of England at £14,000. Last Tuesday, MPs voted down a Labour bid stop 1.1 million children missing out on free school meals. MPs voted 312-254 against an attempt by Labour to block Government changes to Universal Credit rules. The controversy over ending free school meals for poor children, has led to calls for food and booze subsidies for MPs to be ended forthwith. While the average UK wage is £26,000 a year, MPs receive £74,000 per years plus subsidies. The food and booze subsidies, cost the British taxpayer more than £6million a year. It is obscene how hard-pressed taxpayers are paying millions to subsidise MP’s in cheap food and alcohol, while for many families on low incomes the reality is that food banks have now become a necessity rather than a temporary measure, just in order to survive. For many of our poorest children a free school dinner is a guaranteed meal that meets their nutritional requirements and should never have to be compromised - what they have done is absolutely sickening and an utter disgrace, shame on them!